Last week was a quiet one for JADE, but again full of planning and preparation. Without a doubt the most exciting news is that we finally have the packaging ready for JADE's very own #characteroftheday dice! 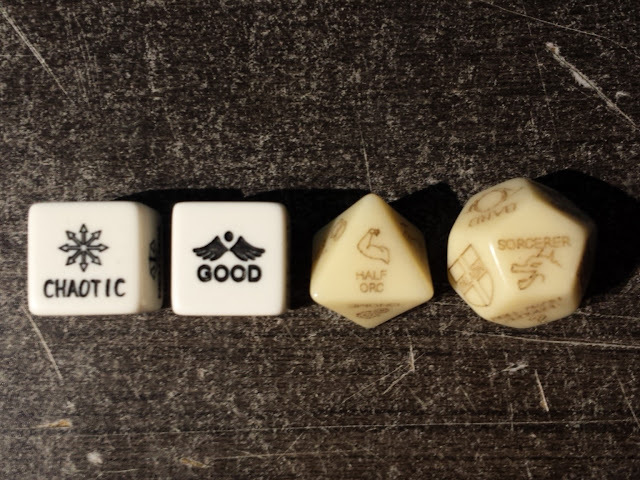 For those of you who don't follow us, every morning (most of the time) JADE rolls a set of Chessex Dungeons and Dragons 3.5 character generating dice, and comments on the possibilities associated with the character. The problem with the Chessex character dice is that they are a limited edition promo item, and are not the easiest thing in the world to come by. So about a year an a half ago we started looking into manufacturing our own. After tons of pitfalls we finally have everything we need! I will keep you all posted with some hype and an exact date that they will go on sale! Stay tuned! A sneak peek of the Race Die! Aside from getting the packaging printed, I also took some time to get a newly acquired game of mine up to snuff. A few weeks ago I acquired a game called Subbuteo. 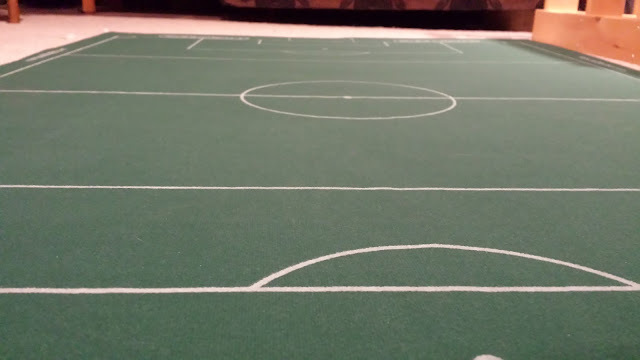 It is a dexterity based, flicking soccer game, that lets you play out a match on a large felt pitch. The game is an immense amount of fun, but I had problem. 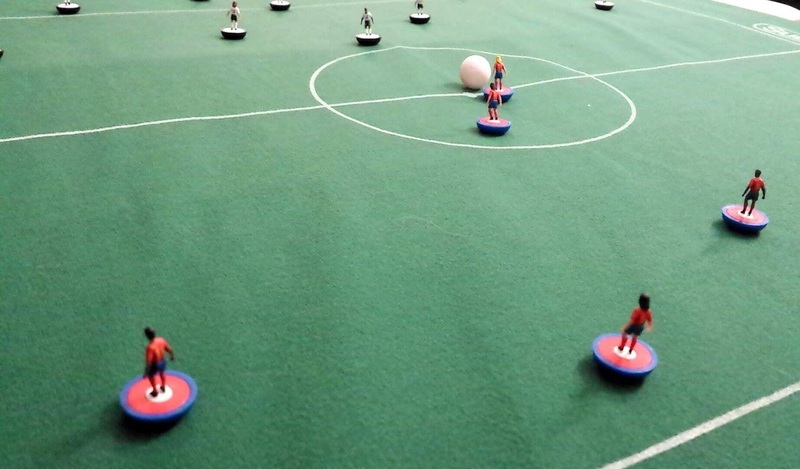 My Subbuteo pitch was nothing more then a felt mat that was 5ft. 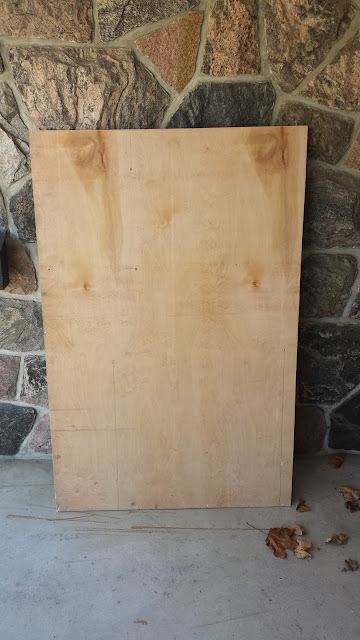 x 3.5ft., and I only had two tables with an added total perimeter of 4ft. x 4ft. Me and my friend Matt figured a way of clamping the mat to both tables and stretching the pitch taught, but it was clumsy, and prone to error, so I had to figure out another way. After talking it over with friends and family I decided that I was going to Velcro the Subbuteo Pitch to a board. That way the pitch would be flat, all on one surface and replaceable. And with some help from my Mum, whom I was visiting this weekend, I did just that. Thankfully one of my Mum's friends is a carpenter, and he graciously gave me this 55" X 35" X 0.75" piece of plywood. 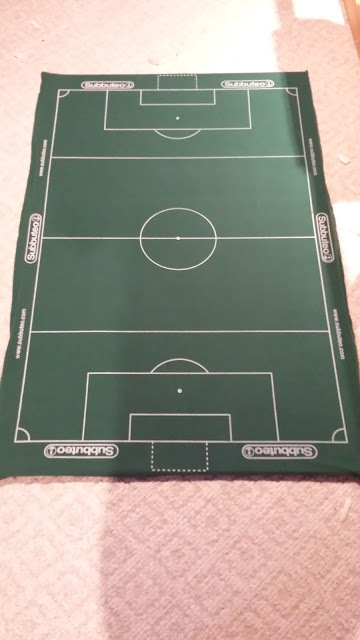 That size on a standard Subbuteo pitch will allow you to fold any access cloth around the board and still keep to the regulation 4cm - 10cm edge. After some measuring and marking, we used a staple gun to fasten the rough part of the Velcro to the wood, and a sewing machine to attach the soft part of the Velcro to the cloth pitch. Surprisingly it worked! The pitch Velcroed to the the board. The pitch was nice and smooth, and just what we needed. It will certainly make my next game a lot more manageable. Sadly the board was too large to bring back with me this last weekend, but my fiancé is going up there next weekend and is going to bring it back. I only have to wait two weeks. And then back to the action! This coming week we have a bunch of board games planned! We are going to be trying a bunch of the pocket games we picked up and have yet to try, as well as throwing down a round of Munchkin Conan and Compounded. Also this Saturday I am starting an epic 1st edition campaign with my cousin called Hymns of A Vagabond, where I play as a level 1 character who doesn't even own a pair of shoes and try to make a name for myself in a vast fantasy world. We are using all of the 1st ed AD&D rules we could get our hands on, so it should pose quite the challenge for me! 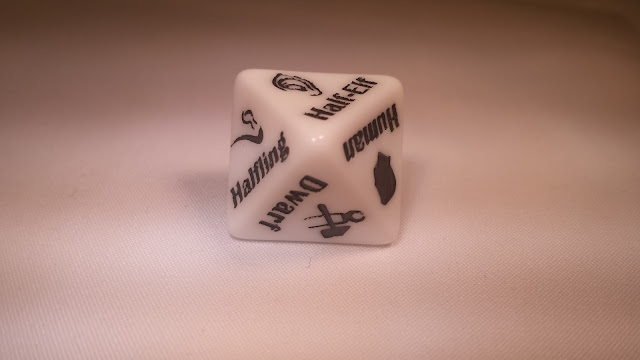 I will keep you all posted with news about the #characteroftheday dice, the out come of our board games, and whether or not I survive my first game of Hymns of a Vagabond.